Most of the sewing I have been doing lately has been for Ladybug. I figured it was Bug's turn to get in on the fun. I had been intending to make him something with stash fabric, but I happened upon a remnant of shark fleece that was just the right size to make him some PJ pants.... I figure I should shop the remnants as long as he is small enough for them to work! I'm sad that I can no longer turn t-shirts into pants for him. 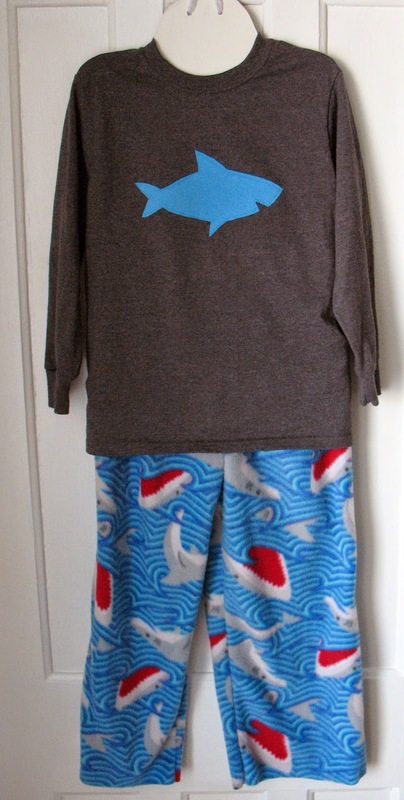 I added a shark applique onto a long sleeved t-shirt so that he could have a complete outfit. I figure that gives him cute and cozy pajamas to wear on pajama day at school. The fabric for the shark came from one of his mother's old t-shirts. I think that will make him quite happy.